=►Heat 4tsp of oil in a pan, add cumin seeds and allow it to splutter. 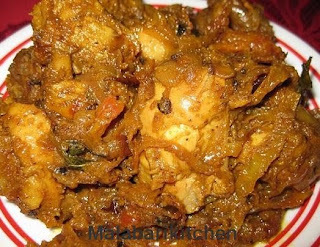 =►Add cardamom, cloves, grated ginger and garlic into it (medium flame). =►Sauté them till all the raw smell of garlic goes off. =►Then add all spices (except garam masala) one by one into it (sim flame). =►Sauté it for 30sec (be careful that it doesn’t get coated because of over burning). 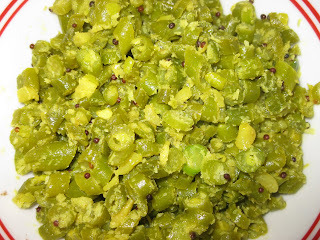 =►Next add chopped onion, curry leaves and green chilies in to it. 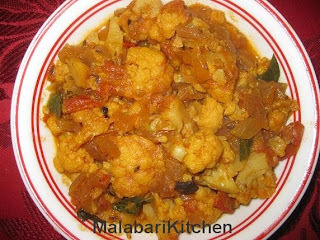 Cauliflower along with one cup of water and salt. =►Close it with a lid and allow it to cook for 15 min on medium flame. =►Stir it occasionally .If you want more gravy then add more water. =►Once it is cooked, add finely chopped cilantro in to it (optional). =►This is very tasty with poratta and also rice. fabulous stuff... right choice 4 a vegetarian..
Great site and great dishes. Feels like I'm home again. Thanks!